If you find yourself needing to fill a car, motorcycle, or other type of battery there are some tips I thought I'd share. I assume filling a battery with battery acid is not really something you want to do in the first place. Let me tell you that most professional mechanics don't like doing it and will try to avoid doing this too. Sometimes though you have to buy particular batteries “dry” meaning they will not come filled with battery acid. So you don't have an option. Even though it might seem like a scary procedure to do it's not that hard. However, there are several precautions you should take before attempting to do this. So here are some tips for filling a car of motorcycle battery. This sounds like common sense but don't wear open toe shoes or sandals, shorts, or t-shirts when filling a battery with acid. Always wear boots or shoes, long sleeved shirts and pants, and you MUST wear goggles or something to protect your eyes. I'd highly recommend wearing rubber gloves when handling the battery acid and battery. Just run to the grocery store and pick-up a pair of glove for dishwashing. While these might not be the best protection they are better than standard latex gloves. You might also want to wear a mask. The reason? When you pour the battery acid into the battery it's going to smell like rotten eggs since it produces sulfuric dioxide. It's not a pleasant smell and can hit you hard if you are not expecting it. If you are going to buy a battery to fill yourself it's a good idea to make sure it's a clear see-through battery. This will make filling it a lot easier and make your pouring more accurate so you do not accidentally overfill it. Since filling a battery is going to smell like rotten eggs, DO NOT do it your basement or house. It's going to smell and it will likely make you a very unhappy camper to have that battery smell lingering in the air. I'd recommend using a table when filling your battery. This again, sounds basic, but you would be surprised by the people that I've seen do it on the ground. Not only is this more complicated but will hurt you knees and back. Unsure why some people opt not to use a table. One of the biggest mistakes people make is to not let a battery sit for awhile after they have filled it with battery acid. The reason you want to let a battery sit, with the holes open, is that air bubbles are usually form when you fill each individual cell. If you seal and then charge it there are going to be air pockets in the battery cells which will ruin the charging efficiency of the battery. This will result in bad battery performance and most likely a shortened battery life. I'd recommend letting it sit at least 10-12 hours possibly 24 hours if you can manage that. Once you let the battery sit for awhile you need to charge it up. If you are going to charge the battery it's best to put it on a slow charge, preferably at 1.5 amps. If you choose a fast charge it might ruin the initial charge, which is the most important one. Letting it charge slowly will ensure that it reaches 100% capacity which will improve the battery performance and longevity. 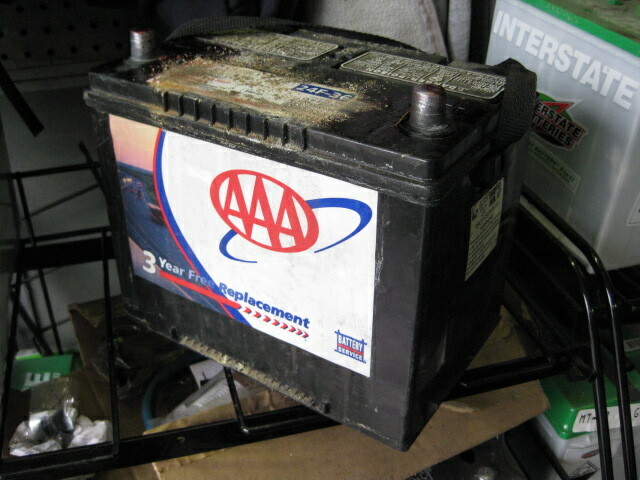 Remember you are handling battery acid which is extremely corrosive and could seriously hurt you or damage your vehicle. Treat it with respect and do not mess around. I also encourage anyone reading this to dispose of old batteries properly by taking them to your local auto parts store for recycling. Be kind to the environment and your neighbors. If you enjoyed this article please checkout my video on How to Replace a Car Battery. Hoped you like my tips for filing a car or motorcycle battery. Think I missed something? Let me know below.